Drought conditions sometimes occur, but can be predicted. You can prepare your horse beforehand by helping him/her to adjust gradually. Before pastures dry and prices of hay rise, stock up on quality hay. Purchasing hay by the ton means you’re getting the right weight for the price you pay. If you buy bales, try to get those stored indoors. If you have no choice but to buy bales stored outdoors, check them very carefully before purchasing. Check all bales to make sure moisture content is low and there is no mold. Ask the seller about protein and fiber content. 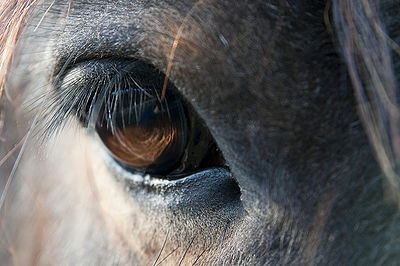 Horses drink about 8 to 10 gallons of water daily. In drought conditions, the dryness will cause them to drink even more. Be sure you can supply your horse with enough water during these dry spells. If in doubt, think about boarding your horse in an area that isn’t affected by the drought. Hay demands and prices rise with drought conditions. Before hay supplies reach their low point, start supplementing feed with beet pulp, alfalfa and soybean hull pellets and dried grains. To ensure gastrointestinal health, use hay cubes and if they run out, hay pellets. Research companies that produce complete feeds that contain a balanced formula with the correct proportions of nutrients. Provide your horse with salt and trace mineral blocks to help ensure that he/she is getting the required amounts of vitamins and minerals. Rotating pastures and weeding and proper fertilization throughout the years will help during droughts. Limiting grazing before your horse eats down to the ground will keep the fields healthier and weed-free. Ask your veterinarian or an equine nutritionist to help you plan ahead for drought conditions.